N'Jeri Eaton is a freelance producer, editor and youth media educator. Her short film Perry County (an IDA Awards nominee) screened at festivals around the country and is being distributed by New Day Films. City Fish (Audience Award Winner, Doc Challenge) premiered at Hot Docs Documentary Film Festival and was broadcast on the Documentary Channel. She was the associate producer for The Waiting Room (Gotham Awards and Independent Spirit Awards nominee) and has produced work for TIME.com. 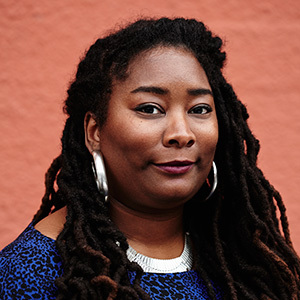 Since 2005, N'Jeri has been a video production instructor at the Bay Area Video Coalition (BAVC) and taught shooting and editing basics to at-risk youth in Oakland and San Francisco. She currently works as the content development & initiative manager at the Independent Television Service (ITVS). She received her M.J. at the UC Berkeley Graduate School of Journalism and her B.A. in visual media arts studies from Emerson College. N'Jeri lives in Oakland, California with her cat named Rube Goldberg.